Finding fresh-made candy hasn’t been a problem, really. You can step into just about any mall or local old-time candy store and get some candy that was just made that day (or heck, make your own). Getting fresh-made candy in your local big-box store or convenience store isn’t so easy. Yeah, it doesn’t expire til 2010, but who knows when that candy was actually made. Would it taste better if you were eating it closer to the day it was actually made? I never really thought about it til recently. Hershey’s has taken fresh-made candy to a new level with their new “Hershey’s Fresh From The Factory” (FFTF from here on) candy. Here’s the deal: go online and order some Fresh From The Factory candy. Hershey’s ships it to you within 96 hours of it being made at the factory. You can start ordering FFTF candy by the end of May but Hershey’s sent me a jar of their FFTF Reese’s Peanut Butter Cups to review a bit early. 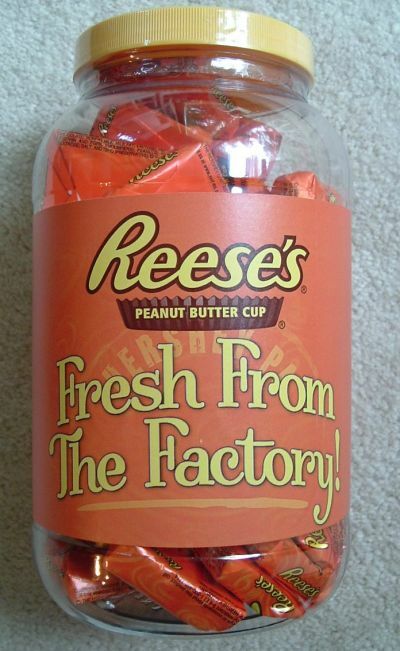 Upon opening the package I had waiting for me on my porch after work one day (and after pinching myself to see if I truly did just receive Hershey’s candy before consumers could get it), I was confronted with a plastic jar filled with FFTF Reese’s Peanut Butter Cups (see image). Opening the jar, my sense of smell was assaulted with the overwhelming smell of peanut butter. I was sure this was the first sign of them being fresh, but then when I thought about it, I wasn’t sure if throwing a bunch of Reese’s into a jar for 4 days would smell the same when opened. (Note to self: try that some day). I opened up one of the individually wrapped Reese’s and noticed it was smaller than normal. I looked at the wrapper again and it said 0.55 oz. (regular ones are 0.75 oz.). I finally tried it and it was good. I love a good Reese’s and this one was great. The peanut butter center seemed just a bit smoother than normal. When I really started thinking about it though, it really didn’t taste that much different than a store-bought Reese’s. My family was in town for my daughter’s birthday so I let all of them try the FFTF Reese’s too. They all agreed they were good, but not really that much different than store-bought. You can order these from Hershey’s and get a 1lb 7oz jar of them for about $26 (including shipping). If they were extraordinarily better than store-bought, I’d probably say to go buy some now, but at that price and given that they don’t seem that much better, I can’t recommend them. I guess I was slightly disappointed – I was expecting them to be much better than store-bought and thought they were only slightly better (of course, slightly better than great is still pretty darn good). If you have someone in your life that likes Reese’s Peanut Butter cups, these would make a great and unique gift. Fresh From The Factory products will not be available on a regular basis and supplies are limited so order early. Please note that ship dates are subject to change. Check in regularly to get a taste of your favorites! hey fftf twizzlers would be well worth the money i bet!